“We are committed to an all-EV future and continue to work in that direction,” said General Motors CEO Mary Barra to The Detroit Free Press. Her company is putting its money where her mouth is, too, as GM announced Tuesday that it will ramp up Bolt production in the fourth quarter to meet demand and launch over 20 new electric vehicles by 2023. 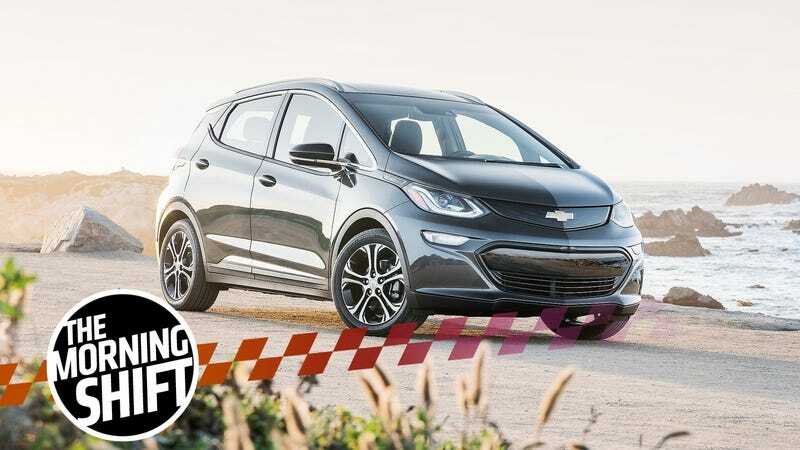 The Bolt has been a decent seller so far, selling 26,005 Bolt EVs last year, 94 percent of which were retail sales to regular car-buying people, as opposed to fleets like government organizations and rental companies. GM did not specify how much they will ramp up Bolt production, however, they noted that some increased production will come out of its overseas plants, such as the one in South Korea. Still, GM’s big sellers are its trucks, and Barra claims that the upcoming 2019 Chevrolet Silverado and GMC Sierra trucks will boost the company’s bottom line as it dabbles in electric and autonomous technology. A 59.8 percent drop in net income and 26.6 percent drop in operating profits in the first quarter were attributed to the lower pickup production to gear up for the new 2019 models as well as a restructuring of the company’s business in South Korea. The National Labor Relations Board held a hearing Monday regarding complaints from three Tesla employees and representatives from the United Automobile, Aerospace, and Agricultural Implement Workers of America (UAW), reports Reuters. At the hearing, Tesla employee Michael Sanchez testified that he was asked to leave his own workplace by a supervisor and company security guards after handing out pro-union flyers in February 2017. NLRB attorney Edris Rodriguez Ritchie claims that Tesla asked its employees to sign “overly broad” contracts preventing them from discussing working conditions—you know, those reasons why employees are looking to unionize. Tesla would be required to notify its employees that it engaged in unfair labor practices if it is found guilty at the hearing. That would be seen as a win by those wishing to organize a union at Tesla. Meanwhile, it’s the last thing Tesla probably wants as the company is looking to slash approximately 9 percent of its staff to cut costs. Hearings are expected to continue through Thursday and take a break until late September, when a decision is expected on the case. Federal prosecutors say the union and Fiat Chrysler conspired from before 2009 through 2015 to violate the Labor Management Relations Act and the automaker enabled nepotism to flourish at a blue-collar training center. The law prohibits employers or those working for them from paying, lending or delivering money or other valuables to officers or employees of labor organizations — and from labor leaders from accepting such items. “From in or before 2009 through 2015, FCA executives conspired with one another, with FCA, with officials at the UAW, and with the UAW, to violate the Labor Management Relations Act,” prosecutors wrote in the court filing. The allegation calling out the UAW and FCA was filed as part of a plea agreement for former FCA executive Michael Brown, who helped run the embattled training center and knew that at least five FCA officials were funneling over $1.5 million in illegal payments to UAW officials. The illegal perks of being part of this corruption scheme were truly insane, including a $365,000 Ferrari, a party that cost over $30,000, $262,000 spent on a UAW vice president’s mortgage, and a $2,180 shotgun. Some friends and family were even hired at the training center as sham employees, who did little to no real work but received a paycheck. There’s actually too many corrupt perks to list here, so it’s really worth reading through The Detroit News’ full piece here. These lavish gifts and payments were aimed at corrupting both the bargaining process between the two entities as well as the implementation of a labor contract that covered thousands of FCA employees. Prosecutors allege that the conspiracy persisted through three administrations of the UAW: through UAW Presidents Ron Gettelfinger, Bob King and Dennis Williams. A former federal prosecutor told The Detroit News that FCA and the UAW could potentially face fines, criminal charges and government oversight if they were found to play a significant role in the scandal. Meanwhile, the UAW’s quadrennial constitutional convention is this week, where Automotive News reports that Williams is set to retire as current UAW president, with retirement perks that include the use of a cabin at the UAW’s Black Lake retreat center in northern Michigan. Toyota’s outlay in Grab is double the size of General Motors’s investment in Lyft Inc. in 2016, underscoring the sense of urgency CEO Akio Toyoda has in shifting the company toward mobility services. The 81-year-old automaker, founded by Toyoda’s grandfather, is preparing for intensifying competition from peers as well as technology giants as the industry transforms. A Toyota executive will be appointed to Grab’s board as part of the deal, which suggests that Grab will buy a lot of Toyotas in the future. The two companies have been exchanging information on autonomous driving, but a Toyota representative would not confirm to Automotive News as to whether they would collaborate on self-driving tech in the future. This isn’t the first time Toyota has been linked to Grab, as Toyota’s trading arm already invested enough in the service to force Uber out of the region last year. Before that, Toyota has been involved with other ride-hailing services. The company bought an undisclosed stake in Uber in 2016, announced a collaboration with Chinese service Didi Chuxing in January and backed another Uber rival, Japan Taxi. Another hint that auto shows may not be as relevant as they used to be in terms of new product news comes thanks to Fiat Chrysler, whose Fiat, Jeep, Alfa Romeo and Abarth brands plan to skip the Paris auto show, reports Automotive News. FCA’s biggest brands join Ford and Volkswagen in staying home from the Paris show, which had formerly been considered one of Europe’s main auto shows. This isn’t the first time these four FCA marques skipped one of Europe’s big auto shows, however. Last year, these same four skipped the Frankfurt auto show, which alternates with Paris as Europe’s main fall auto show. Neutral: Is The UAW Good Or Bad? Unionization can protect workers’ rights and give a voice to the rank and file, but the UAW is a strange case. On one hand, they’re sticking up for Tesla workers’ rights, but on the other hand, it’s been plagued with problems and scandal for years—all the way up to the top. Is America’s main auto union still a force for good, or should it be nuked from orbit so workers can organize something better?